Hyundai is backing the first mobile optimised site for Haymarket's Autocar, built after the car magazine found almost a third of its web visitors were accessing the site via mobile devices. The new site, which can be found at m.autocar.co.uk, has redesigned reviews, news and videos to be more readable on the mobile phone. There is also a simple drop down menu at the top of the page to let users tap to find things such as the make and model of car they are interested or the section they want to find. The Hyundai sponsorship was negotiated by its media agency Havas Media. Autocar expects the site will get 500,000 visits in its first month, creating two million page views, and predicts this will double in 24 months. Jim Holder, the editor of Autocar, said: "A record number of people are interacting with Autocar digitally, and the new mobile website is the perfect compliment to our market-leading website, digital magazine and apps." 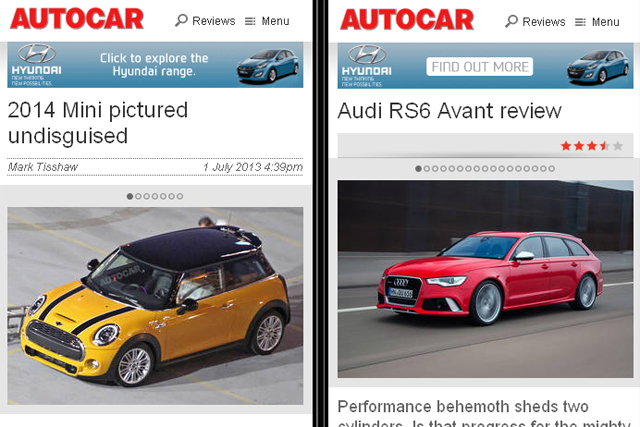 The mobile version launches after traffic surged and almost doubled in many areas of the site, such as in car reviews, following Autocar.co.uk's relaunch last year. Alastair Lewis, the publisher of Autocar, said: "We're particularly pleased that a major car manufacturer of the scale and importance of Hyundai has seen the significance of our launch and chosen to put its weight behind it from launch. "We are confident that this mobile site is the next step in Autocar's rapid and successful digital expansion." Autocar is using page DNA, such as what content people are reading, from its desktop site to improve the mobile site and Tealium software will be used for analytics and page ads. Chris Lowe, the publishing manager at Haymarket Media Group, said the site has been created for the next 18 months, to satisfy consumers and advertisers until Autocar develops a responsive site, which can adapt for different formats. He said: "Ads and analytics have been at the forefront for us to learn as much as possible about the different user journey and be as flexible and cutting edge for advertisers." Autocar is owned by Haymarket Media Group, which also publishes MediaWeek.co.uk.